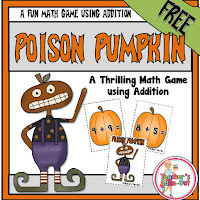 I have a FREE addition game called Poison Pumpkin. This game uses facts 2-9. The game is thrilling and exciting! Your students will scream with delight! Place all addition cards in a can. Players take turns drawing a card and stating the addition fact. If they state the correct sum, they keep the card. If they draw the Poison Pumpkin card, they must put all the card they are holding back in the can! The first player to collect 5 cards is the winner. Here is the multiplication version of Poison Pumpkin. This is FREE too! Just click the picture to read more about it and download it to start using today! 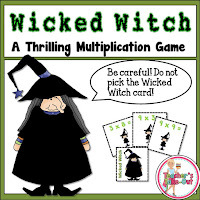 This is a great game to practice multiplication facts! Here's another Freebie! Pumpkin Glyph! 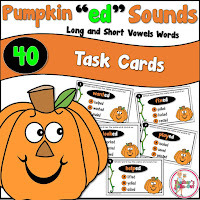 Halloween Theme Centers and Activities has engaging, educational ideas to use for your party or for the month of October. It uses math, reading, writing, and science activities to keep your students learning all month long! These centers are perfect for 2nd and 3rd grade classrooms. Over 50 pages of ideas! You can purchase Halloween Party Center and Activities right here for a discounted price!